Panini has positioned Pinnacle basketball in it’s debut set as a low/mid range product that has a fairly lengthy insert checklist with lots of parallel cards. The rookie class is highlighted by Michael Carter-Williams, Victor Oladipo and Ben McLemore, among others. Jumbo boxes will be found at hobby shops and online retailers, while you should be able to find retail packs & blaster boxes at places like Target and Wal-Mart. Whenever you have a product released for both hobby & retail level – there should be plenty of non-numbered base cards, inserts & parallels in circulation. 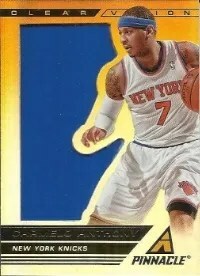 With a weak 13/14 NBA Rookie class and Kobe Bryant (one of Panini’s exclusive athletes) basically hurt all season, the demand for Pinnacle basketball should be weak at the current retail price. Personally I think some of the insert cards look cool, and they don’t show up on the photos well because they are utilizing some ‘old’ Pinnacle technology that ‘older’ collectors should remember fondly.